Spring is still here but, having a good stash of Christmas cards comes really handy when it's time to start mailing them to family and friends. I'm linking this card to some challenges down below. This lovely and super sweet image is from the Power Poppy set called Frosted Gingerbread, I stamped it onto a die cut panel of Strathmore water color paper with Versafine black ink and colored it with some SU markers and my Sakura Koi water colors. I'm sad to admit my SU markers are very old and some are really dry so I've often had to use some water to be able to color with them, unfortunately, I do not have any of the re inkers but that's ok, I still use them and for the amount of color I need for my projects, they still work fine.....but I digress.....After coloring the image I then I applied some Ranger Texture Paste where the "snow" or "icing" is, I love the 3D effect I got. This stuff actually looks like sugar icing, so pretty. I added some small pearls to the roof and a bit of Wink of Stella (which is also kind of gone, need a new one, sheeesh!!) everywhere there are candies. Here is a picture of the finished inside of my card. Some of you have asked me why I highlight the words "finished inside" when I show it to you and it's because sometimes the inside has been confused with a card front and I've been told that "it didn't follow the challenge's theme, sketch and/or colors" so I just want to be sure the challenges I participate in know that the first picture is of the front and the second one is the inside. Both the sentiment and the little Gingerbread cookies are from the same set. I'm linking this card to the following challenges. 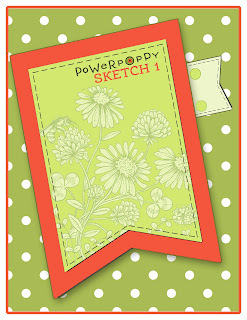 Power Poppy April challenge "Pick a Sketch", this is the one I used. Merry Monday Challenge #245 "Use Kraft"
Christmas at Sweet Stamping "April Challenge" Anything Christmas. 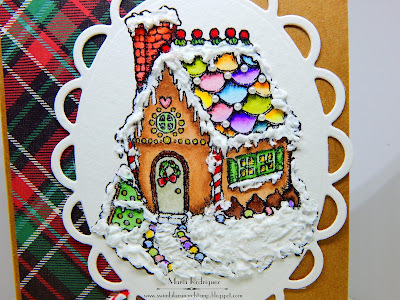 Crafting By Designs "Have yourself a Merry Little Christmas". 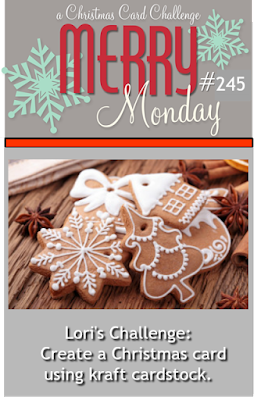 Fab n' Funky Challenges #348 "Christmas"
Thank you for stopping by, I always read every single comment you so kindly leave on my posts, I want you to know I appreciate them more than words can express. Until next time, happy stamping. 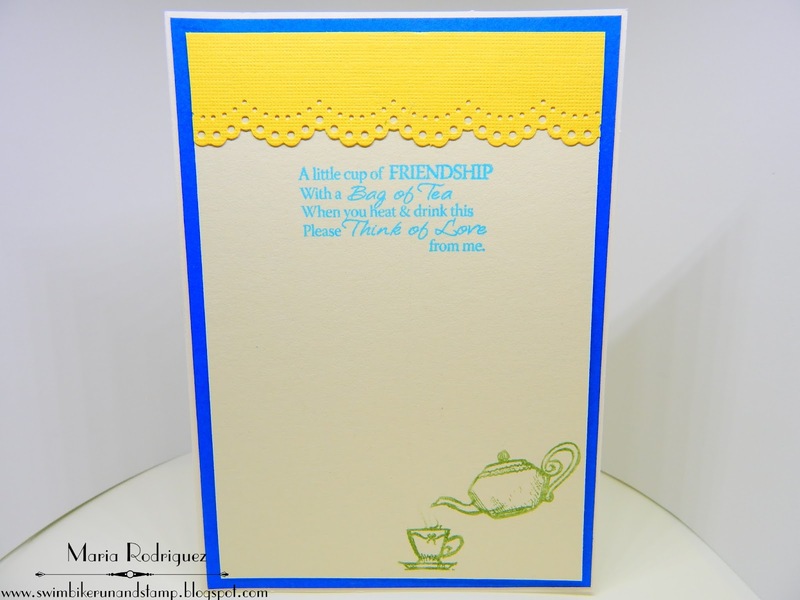 Hello dear friends: There is a new challenge over at SHOPPING OUR STASH and the theme this week is COFFEE OR TEA. I love both beverages, I drink coffee early in the mornings so I can fully wake up and start the day but I love tea in the afternoon, specially Orange Chamomile, soothing when it's piping hot and so refreshing when cold. Here is a card that I hope will inspire you to join my teammates and I in our gallery. 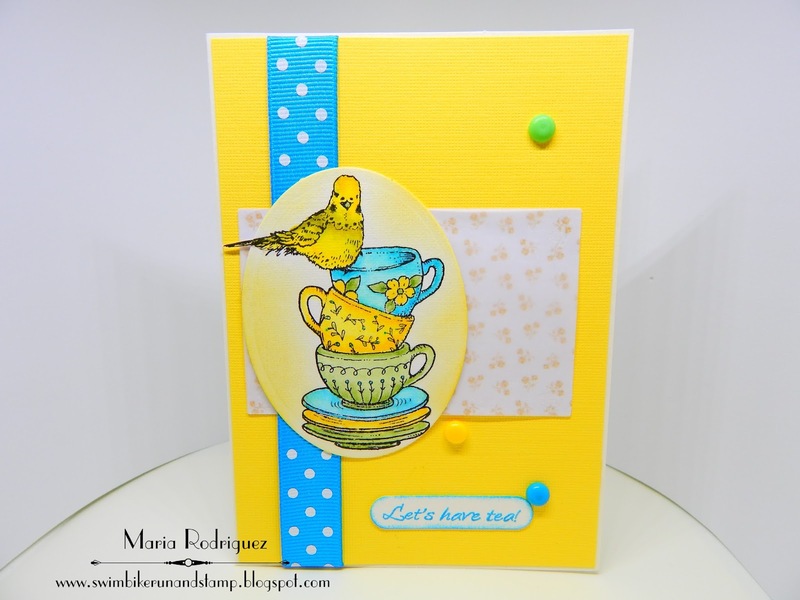 This adorable image is from a Power Poppy set called Short Stacks, I just love, love the sweet little parakeet, this colorful birds are so cute and come in the most amazing colors, I chose this bright yellow for mine today, very fresh and vibrant for Spring. I stamped the image onto a die cut piece of Strathmore mixed media paper with Stazon black ink and colored it with my Sakura Koi water colors, adding a bit of shading with SU markers. The pattern paper is from a discontinued line from Lili of the Valley, ribbon and enamel dots from my stash. Here is a picture of the finished inside of my card. 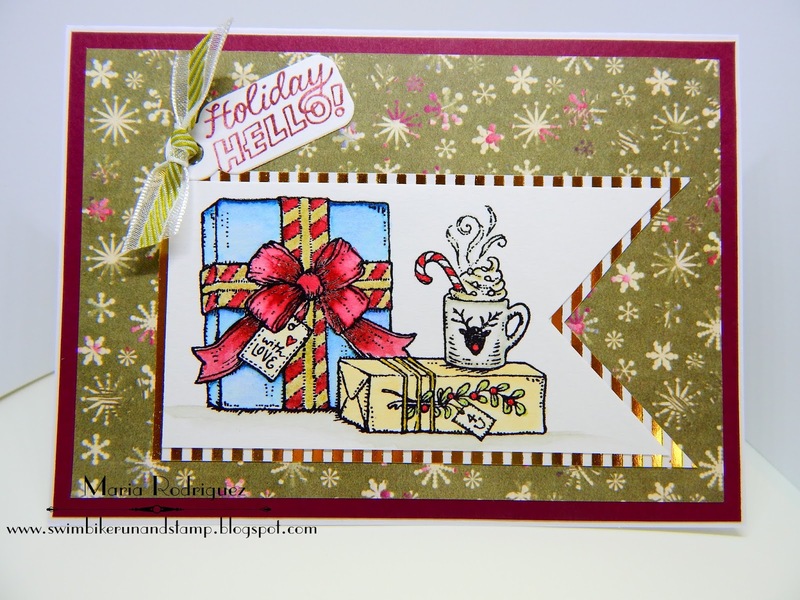 The sentiment is from an old Flourishes set called "Christmas Tea" and so is the little pot and cup. 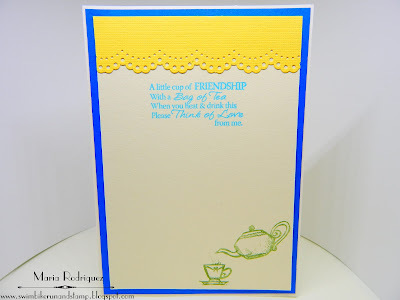 I hope you go feel inspired to join us in the SHOPPING OUR STASH gallery, for more inspiration, please go to our challenge blog and check out the awesome cards from my teammates, be sure to stop by their blogs and leave them some comment love. Hello dear blogging friends: We have a new challenge for you to play with over at RETRO RUBBER, this time we want you to use BUTTONS in your creations, we can't wait to see what you share with us in our gallery. Here is my card that hope inspire you to play along. I did not have any pretty buttons to make a card for this challenge, just the regular buttons like for shirts or blouses but nothing good enough to use here but, the other day I was at the craft store to get some supplies and, before I leave, I always check the bargain section at the end of the store, this time I found this beautiful buttons right there among other stuff in a small plastic bag, there are about 30 buttons of flowers, watering cans, hats and gardening tools for $1.00, I also found a flower and fence die for $3.00, I love a bargain, don't you? Anyway, I stamped the leaf stem from the 2014 Stampin' Up! "Peaceful Petals", several times, masking the image as I went down the row, with Wild Wasabi ink, then, colored the leaves with Prismacolor pencils, I sponged some Wild Wasabi ink for the grass and some Tumbled Glass distress ink for the sky. The little sign is made with THIS Purple Onion stamp trimming it to make just a sign I could hang from the fence with some copper wire. 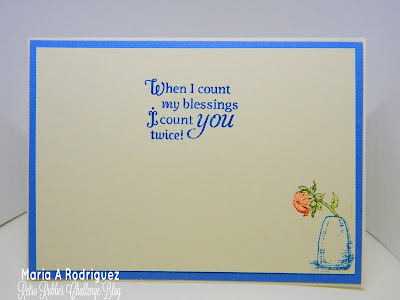 The sentiment on it is from a 2009 retired Flourishes set called "Sweet Violets", (by Marcella Hawley) and the butterflies are from THIS CC Designs set that is discontinued. 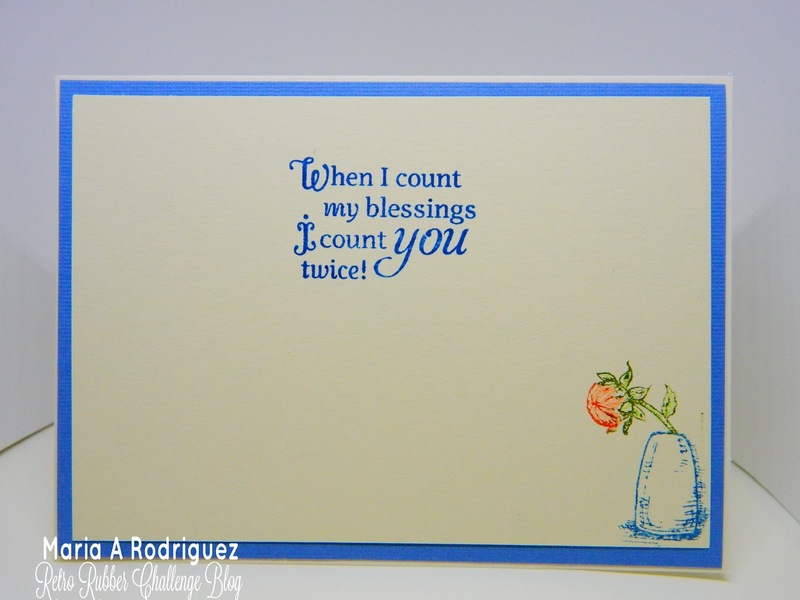 Both the sentiment and the little vase in the corner are from a 2013 Flourishes set (images by Marcella Hawley) called "Dahlias". I hope this card inspires you to join my teammates and I at the RETRO RUBBER gallery, for more inspiration, hop over to the challenge and click on their creations, don't forget to leave them some comment love. Please remember that the stamps you use to participate and have a chance to be picked as "Top Five" and have the chance to be our Guest Designer MUST BE OLDER THAN A YEAR, if you can give us the age of your stamps or how long you've had them, it would be fabulous. Also, you can combine our challenge with up to 10 other challenges, including ours. For more details on our simple rules, please check them out at the top of the challenge page. Hello everyone: I need to keep increasing my stash of Holiday cards and, with that purpose in mind, I created this one, that I will link up to a few challenges at the end of this post. This image is from a Power Poppy set called Cozy Cupfuls, I can almost smell that hot chocolate with whipped cream and marshmallows. I stamped it onto a piece of Strathmore mixed media paper with Stazon black ink and colored it with a few SU markers and a little bit of my Sakura Koi water colors. The background pattern paper is from a discontinued line from Lili of the Valley, the one with the gold stripes from My Paper Studio, the sentiment is from another Power Poppy set called Merry Littles, which has a whole bunch of adorable little images, perfect for the Holidays. The little gift image is from Merry Littles and the sentiment is from Ponsettia, another beautiful Power Poppy set. 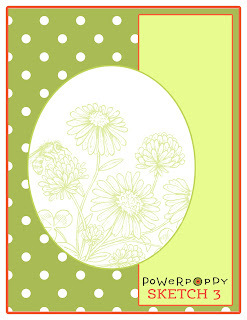 Power Poppy "Power and Spark" Pick a Sketch April Challenge. I picked this one but I didn't slant the panel. Crafty Hazelnut's Christmas Challenge "April/Anything Goes as long as it's Christmas"
ABC Christmas Challenge "H and I are for?" H is for Home, I is for Informal, I went with the Informal. Double D Challenge Top Three Pick. I was a PPA Pick!